We were up at 3 am and was almost ready when the car service arrived at 4:45 am. One of us was ready to go. The flights were fine and on time. Of course our plane arrived at the furthest gate on concourse and the connecting flight on another concourse at the furthest gate. I have decided that all the planes parked at closer gates are blowup replicas and nobody is really boarding these planes. We got to the motorhome and went shopping for supplies. 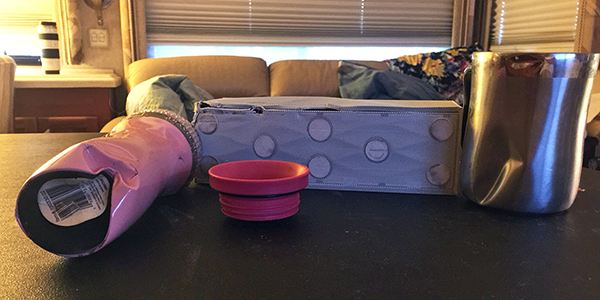 I have included a picture of the items the found under the kitchen slide out that was keeping the slide from going all the way out. I had changed our plans due to less time and just picked one place to go. We are in Susanville, California at a nice park. 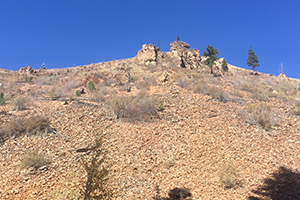 It is about 85 miles out of Reno and an easy ride. So now I am planning the rest of the trip now. 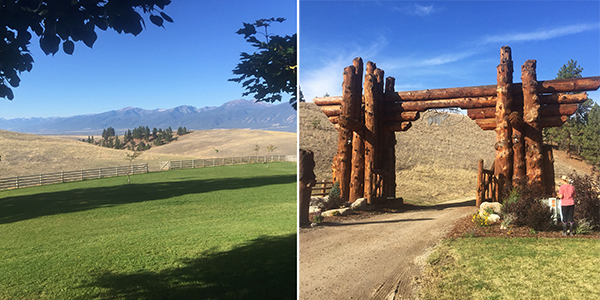 Montana is the ultimate destination. Today we got the 11:00 am start and immediately made a wrong term and got on a dead end road and could not U-turn. I was at entrance to a mobile home park and owner waved me off from entering. She thought I was heading for the park we just left. She finally saw my dilemma and allowed me to enter and had a great spot for me to U-turn. So we were then off to do mountain climbing on a narrow road which we all know Joanne loves. That was about 50 miles and then we entered a beautiful valley that we never left so driving was easy. A lot of farming and all the lakes were virtually bone dry. The drought has really shown its affect. The owner of Park where we are staying said this has been the case for several years. This is something I didn’t realize was so serious. The west is suffering pretty badly and no end in sight. 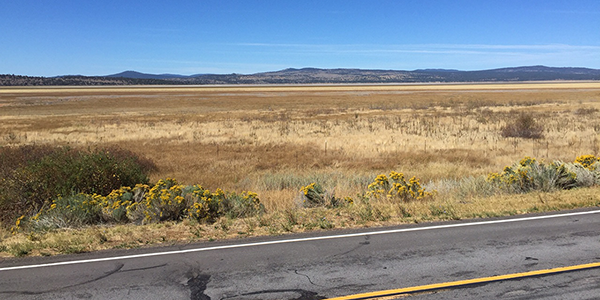 We spent the night at Klamath Falls, Oregon. So another 11:00 start in our future. Of course, I had failed to mention that we are still having trouble with the driver side back hydraulic lifter which was not able to be repaired. Why you ask..??? Because the motorhome hydraulic lifter always worked for the dealership when it was tested several times. So I was excited Tuesday night because I knew it would work. Ha!!! No way. It didn’t go down. The motor home was telling us welcome back!!!! I know there is a secret hard to find hydraulic stabilizer guy/gal who can fix this damn thing. It is now a quest!! Where in America is this person!!!! The day actually looked pretty crappy for the first hour or two and then the sun was out. 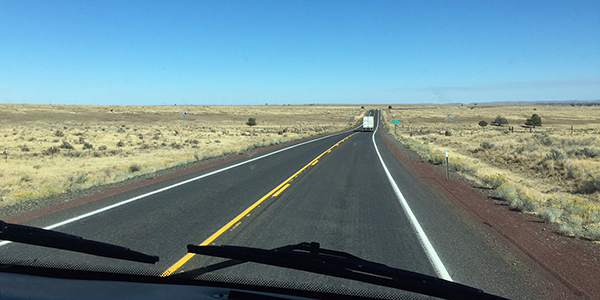 I have been planning each day in the morning keeping our trips about 180 – 200 miles a day. I only have a final destination not anything in between. Our first stop was about 400 feet to fill up with diesel. The KOA we were staying at had their own pumps. I thought this was a great idea and this was the first time I had seen this. Good price and I estimated 90 gallons based on the fuel needle. It was like 86 gallons. A mere $220.00. Last year’s trip would have cost for same fill up 350+. So the next stop was Fred Meyer’s food, clothing, and pharmacy store. It was a great store and I took on provisions. This was about a 140.00 stop so I was now at 360.00 day and gone ¼ of a mile. You got to love motor-homing. The trip here was mostly scenic and no mountain driving so Jojo was pleased. The route today was very beautiful and the small towns were ¼ to ½ mile commercial districts. Seems to be a lot of sportsman activity with the little hotels and hole in the wall restaurants. It was easy to pick out the best restaurant by looking at the parking lot. I think that if I owned a restaurant in town like this I would buy a bunch of old cars and just park them in my lot. I am sure the place would be packed!!!! 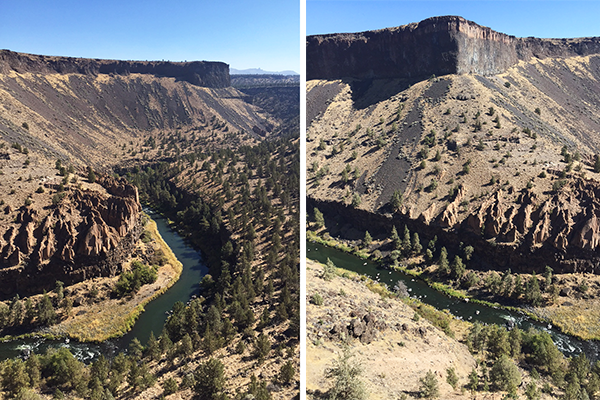 The motor home park we are at is Crooked River RV Resort just outside of Redmond, OR and it is, from a view prospective, one of the nicest spots we have stayed. Remnants of Sedona, AZ. I always call ahead to make a reservation at a motor-home park and I always forget to ask if the site is good for satellite reception. So as you can imagine no satellite reception thus no TV!!! Jojo and I had to actually talk to each other. It was a new experience. My Verizon Wi-Fi worked great so it was an Apple TV night with spare ribs and green beans compliments of Fred Meyers. Today proved to be another slow start as we left Crooked River about noon. 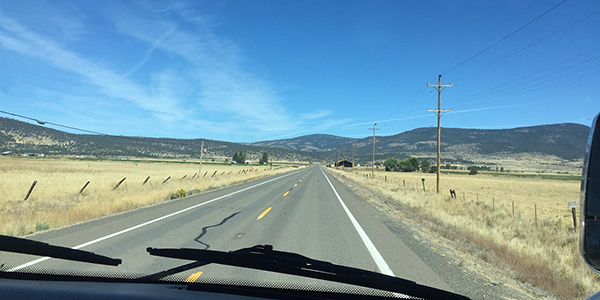 We are on our way to Toppenish, WA to stay, at what I expected, a casino’s RV Park. It is about a 180 mile trip and again we saw such expanse of rolling hills and a lot of hay growing. The fields had a golden look at times. Hay is very popular crop although you do not see any large herds of cattle or horses? Where are they? I had commented to Jojo that I didn’t see any wind turbine fields. We didn’t for quite a while and then they came. This land was made for wind as it was always blowing. 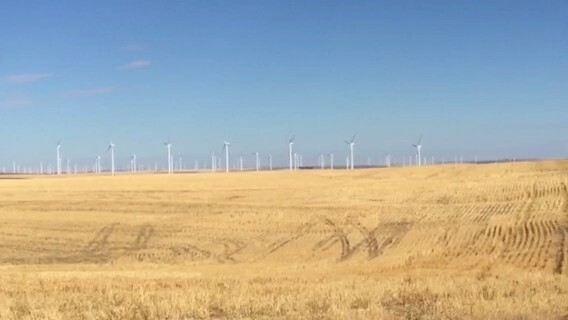 As far as we could see were the hills covered with wind turbines. Quite a sight!! 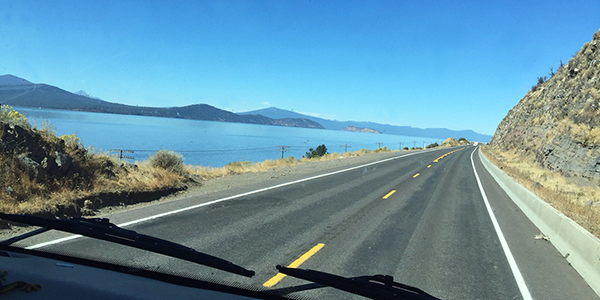 We got pretty close to a few that were turning right at the Oregon Washington state line on the Columbia River. They are huge close up and we wondered what the might sound like on a quiet evening with no external noise around. The Casino Park has all the amenities, but built for volume, not nice parking spots for pull through. You need a 60 foot spot towing a vehicle and all of theirs were 45 feet so you were forced to disconnect. I am assuming this was done for marketing purposes so you would want to drive to the casino. Anyway, tonight we had satellite connection. Need I say more!!! Today we got an earlier start as we had a 233 mile trip. 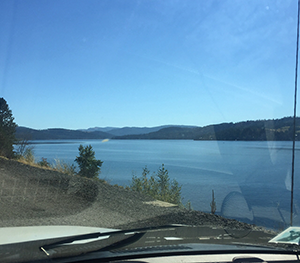 We were heading to Coeur d’Alene, Idaho. So we left about 10:30 and I made a wrong turn pretty much right away. About a 10 mile detour extra. I thought we were going to be on back roads most of the way like the rest of the trip, but I was wrong. We had interstate driving the whole way which was easy driving. There was more and more expanse again today. We still are in awe and wonder who the heck lives in the houses we see. Again, hay is the big crop. We arrive at our motor home park and we are down on the water. Great spot and we are going to stay 3 nights just to get a break from breaking camp each night. Today was nice. We drove around the lake. We started on the west side and very little view. As we rounded the bottom and went to the East side the vistas improved. There are a lot of summer homes on the lake and a lot for sale. There were some quaint towns along the way. A little town called Harrison had the ice cream parlor and a restaurant packed with bikers (Vrooooohm) and bikers (peddlers). All and all a pretty nice day of sightseeing. So just so you know, the refrigerators ice maker is not working. The motor home continues to bust our chops, but in the whole scheme of things this is a 1 out of 10. Not a big deal. 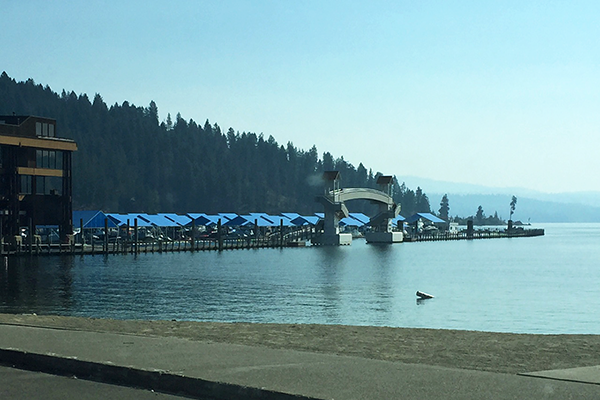 Today we toured Coeur d’Alene. Coeur would be heart in French. D’Alene is “dah-lene” phonetically speaking, I think. 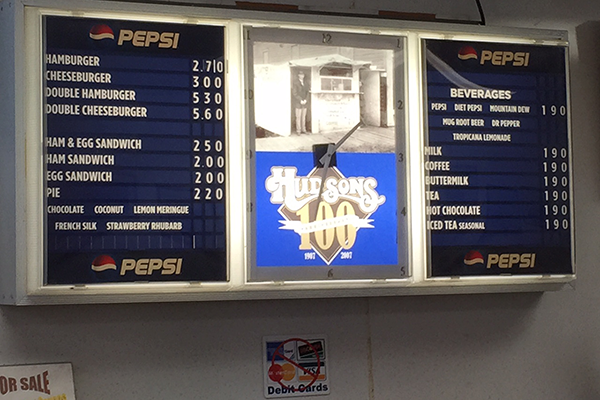 We had a cheese burger at Hudson’s, a 100 year old burger joint in downtown. Only had a soda fountain type seating and people were standing waiting for a seat. I got 2 cheese burgers to go and passed on the pie and that was difficult. We parked on the water and had a burger with hot mustard and the home made ketchup suggested by an old patron waiting in line waiting for his seat. We drove the back streets and looked at the old homes with the big porches. 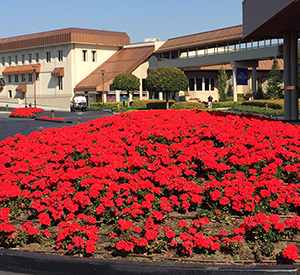 The flowers were still in bloom and the trees had started to turn their colors. A perfect Spring/Fall. We ended our adventure at Walmart of course to get Jojo a hair wash and dry and me a haircut. That was very traumatic for me going to Walmart to get my hair cut for the first time. What a snob I am. They did a great job and freed me from my snobbery!!!! Today we didn’t leave until about 12:30 pm as we only had about 67 miles to drive. Once on the open road I had realized we had 167 miles to go not 67 miles so we would be later than I expected. We had a nice ride to Missoula, Montana which was all interstate. The mountain pass was beautiful and took us about 4 hours. We were heading to Paul and Alice Watterworth’s Elk River Ranch to check out the wild life and hopefully see some elk and deer. Well, Paul and Alice have a beautiful place and a lovely home. We packed in a truck and went driving the local mountain roads with various stops to stretch my left knee. It was a nice easy day and the vistas we superb. We got to participate in the feeding the sheep. They will follow you anywhere if you have their food. Today was a slow day. Jojo went to “Town” with Alice and Kirby to do a little shopping and Paul and I kicked around the ranch and fed the sheep and horses. I had asked the group if they would like to see Jojo’s slide shows and they loved the idea. So we showed them 2 presentations and they really enjoyed them. Every time I watched them, I enjoy them and realize the work Jojo put into these presentations. Paul had gotten a drone for his birthday so Austin flew it for us. It goes up to 400 meters and can technically fly 2 miles away. Pretty interesting. So Paul drops us off at the Days Inn Airport. I selected the hotel because it promoted a 24 hour airport shuttle and restaurant. It had no restaurant but it did have the shuttle. The room smelled like smoke even though it was touted as non-smoking. The nearest restaurant was a very short walk and was a Deli/bakery. So I functioned as room service for Joanne. We dined on a Reuben sandwich and a Gourmet Roast Beef Sandwich with chips. Actually both sandwiches were they highlight of the night. Dependable Larry was there as he always is and we were home before we knew it. Another great trip came to an end.